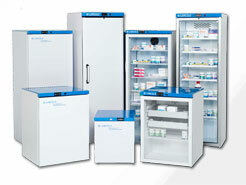 MediSafe supplies Labcold pharmacy and vaccine fridges that have been carefully designed and constructed to meet the needs of healthcare professionals. View a printable PDF price list and spec sheet. Labcold pharmacy and vaccine fridges are guaranteed to keep costly vaccines and medicines in optimum condition, and as they are available in a variety of sizes, they are ideal for consulting rooms through to the dispensary. Labcold Fridges come with a 12 month parts and labour warranty. Pricing includes standard delivery within Mainland UK to a ground floor goods inwards point, usually within three to five working days. PLEASE NOTE: No WEEE surcharges are shown within the above price, by its acceptance you agree to make alternate arrangements for disposal under the WEEE legislation. For an overview of the vaccine fridges view the brochure PDF here or for further information contact us at MediSafe. We'll be pleased to help.